Inter national Compost Awareness Week (ICAW) is the largest and most comprehensive education initiative of the compost industry. It is celebrated during the first full week of May. Started in Canada in 1995, ICAW has continued to grow as more people, businesses, municipalities, schools and organizations are recognizing the importance of composting and the long-term benefits from organics recycling. 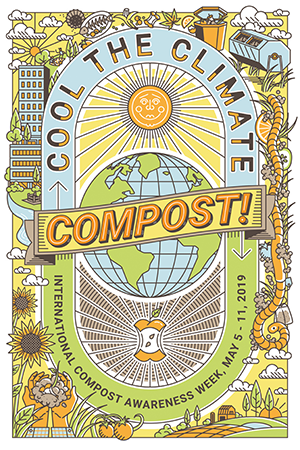 The 2019 ICAW theme, “Cool the Climate – Compost!” recognises the connection between soil health and climate. By composting, carbon captured by plants from the atmosphere is returned to the soil. In addition, the compost, when returned to the soil, provides resistance to drought and disease, adds nutrients, improve its workability and reduce the release of nitrous oxide. Throughout the week of ICAW, community and business events are held to encourage and celebrate composting. All types of composting – from backyard to large-scale are promoted. Events include tours of compost facilities, school gardening programs, compost workshops, lectures by a well-known gardening expert, compost give-away days, to name just a few.